The disturbance set to impact our area later tonight into Saturday is currently dropping nearly due south out of the Great Lakes. This will arrive during the later part of the day. 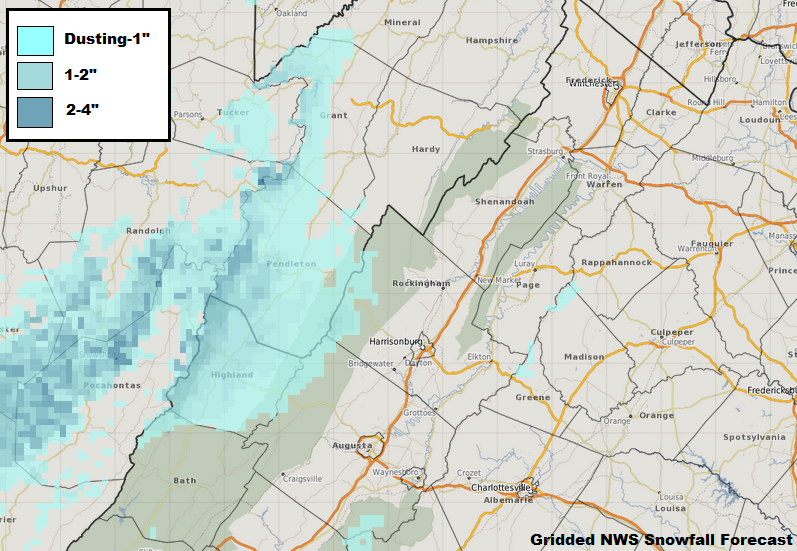 -higher elevations, thinking ridges above 3,000 feet, may receive their first accumulations. Anywhere from Warm Springs to Monterey to Franklin, WV may squeeze a dusting to a few inches out of this. I think the RGEM (Canadian) model from early this morning does a fine job showing what's going to happen...note how the steadier precipitation and best snow chances follow right below the track of the upper level low....the Shenandoah Valley actually doesn't even see an all day rain out of this...just on and off showers. The main batch of precipitation will move out of western VA by evening but northwest winds will allow any leftover moisture to be wrung out as light snow showers across the usual western facing upslope areas. The map below matches my thoughts on where accumulations across our area will fall. This includes the higher elevations of the Alleghenys including both Highland and Pendleton counties, possibly even stretching into far western Rockingham and Augusta. It wouldn't surprise me if the top of the Blue Ridge Parkway near the Shenandoah National Park also managed a dusting or so, but I think this is less likely. Elsewhere, I think precipitation falls as mostly rain with snowflakes mixing in for a time Saturday morning. Have a good weekend.